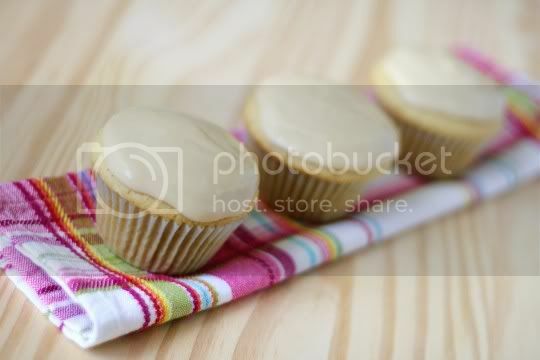 The classic flavor combination of maple and vanilla is emphasized in this stellar vegan cupcake recipe. These flavorful, sticky-sweet treats are rich, sugary, and decadent. You'll want to show the world just how delicious vegan desserts can be, which may be difficult since you're going to want them all for yourself! These cupcakes don't just incorporate plain ol' vanilla for flavoring: an entire vanilla bean is actually used, so make sure you get a good one! This is probably the most difficult part of the recipe, as the bean must be steeped until soft before you scrape out the seeds. These "seeds" look like a frightening black paste, but they are so fragrant and aromatic that you'll quickly understand the depth they're going to add to the cupcakes. The finished cupcakes are bit dry, and perhaps more muffin-like than they should be...but that's okay, just wait. 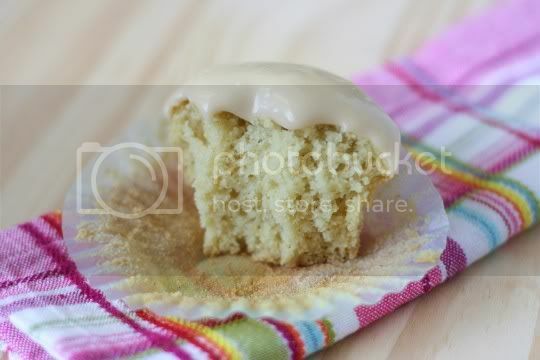 The flavor is so good, and the flecks of vanilla bean strewn throughout give these cupcakes a gourmet appearance. They're sweet and a bit salty and taste very similar to vanilla bean ice cream. The maple-cream cheese frosting has its pros and cons. The flavor is absolutely divine: it's buttery, maple-packed (thanks to a little maple extract, which works wonders), and super sweet (I also love that the "off" taste of the tofu cream cheese is completely undetectable). Fortunately, this totally erases any reminder of the slightly dry, not-as-decadent-as-you'd-like cupcakes, and used together, you've suddenly got an A+ dessert. The maple and vanilla flavors fit together in a perfect sugary harmony. You'll be in heaven after your first bite. The sugar content makes these very rich, so make sure you eat these with a nice cold glass of (unsweetened and light) soy milk. My main problem with the frosting is that it isn't really a frosting. It's more of a thick, spreadable glaze. Which is fine, don't get me wrong, but don't try to pipe this onto your cupcakes...it will just melt into an unshaped glossy beige mass. (And yes, my cupcakes were completely cooled before frosting, and the frosting was thoroughly chilled.) You could try adjusting some of the ingredient amounts--more sugar, less butter, etc.--or maybe even try subbing out the butter for shortening, which at least is sure to stay solid. Complaints aside, the frosting is so good that you may want to just eat it plain. Or since you're guaranteed to have a lot leftover (the recipe could easily frost two batches of cupcakes), use it as a fruit dip, a pancake topper, even an ice cream accompaniment. Make again? Yes, possibly with some adjustments to the frosting recipe. Preheat oven to 350. Line 12 muffin cups with liners. In a medium saucepan, bring soy milk and vanilla bean to a boil. Turn off heat, and let cool for one hour. Remove vanilla bean, split it open, scrape out the seeds (looks like sticky black paste), and add them to the soy milk (discard the pod). 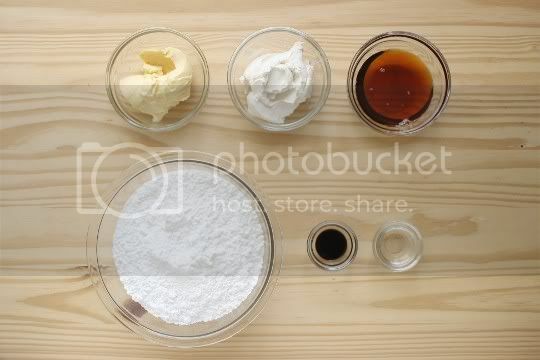 In a large bowl, sift together flour, baking powder, baking soda, and salt. In a separate large bowl, cream together butter and sugar until light and fluffy. Add egg substitute and vinegar, and beat again. 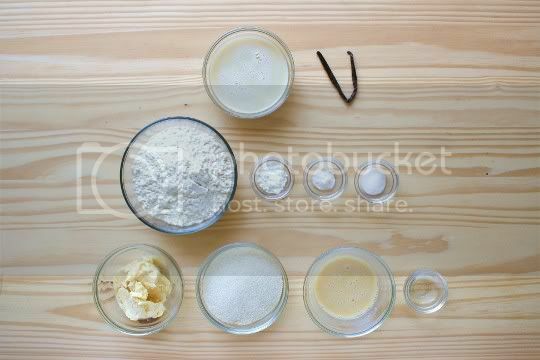 Alternate adding half of flour mixture and half of soy milk to butter until well blended and smooth. Pour batter evenly into muffin tins. Bake for 20-25 minutes or until inserted toothpick comes out clean. Cool for 10 minutes in the pan, then remove to a wire rack and cool completely. In a large bowl, beat butter, cream cheese, and maple syrup until combined. Add 2 cups sugar and beat until light and fluffy. Add maple extract and remaining sugar and beat until completely smooth. Chill until ready to frost cupcakes. These look INCREDIBLE! Vanilla + maple, what a perfect combo. yum- vanilla bean and maple are two of my favorite flavors!! Such a beautifully composed photograph. Thanks for this recipe and your suggested alterations. I've made a note to halve the frosting recipe quantities (otherwise I WILL eat the rest, or spread it on bagels). Also to use half veg shortening and half vegan margarine in said frosting.